Naming the Twins is the Nova Scotia based, harmony rich duo of Robbie Smith and Kath Glauser, whose vocal blendings sound a bit like Simon & Garfunkel, if Art was a girl, a bit like Peter, Paul & Mary, if one of the boys was taking the night off. 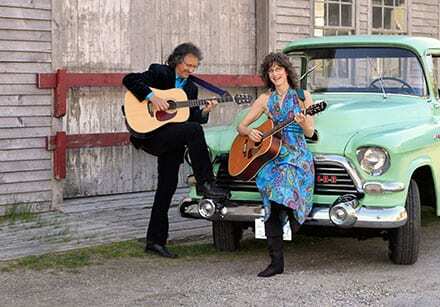 Their original material maintains the tradition of Ian & Sylvia, Gordon Lightfoot and Stan Rogers. Their energy, casual banter, wide variety of song styles and remarkably well matched voices captivate audiences wherever they perform. Their presentations are well balanced with thoughtful ballads and toe-tappin’ numbers, transporting the listener with lyrical imagery and sweet harmonies. Robbie Smith has been a songwriter, singer and player of instruments all his life. From an early age, through the windows of his scenic home outside Shelburne Nova Scotia, his imagination took flight gathering scenes and circumstances which flowed back through his pen and onto the page. His truly inspired lyrics capture the essence of life lived by and on the sea and have also captured the attention of Roger Whitaker who has recorded four of Smith’s songs. Robbie has also shared the stage with Pete Seeger and John Allan Cameron and recorded several albums of his own. In 2008, after years of being a solo artist, Robbie was taken with the voice of an acquaintance and knew he had found his vocal soul mate – a special blend that some performers never find. Kath Glauser brings her clear engaging voice and vocal harmonies to the duo to breathe life into those lyrics…she’s a natural with a great sense of harmony and timing.